So, I mentioned a few weeks ago that I plan out our meals and go to the grocery store on Sunday night so that we can make sure to only buy what we'll eat and save money. 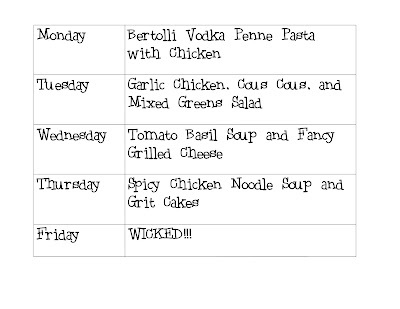 In an effort to keep myself in line with my plan, as well as share my ideas with the blog-0-sphere (my fans, as Jake calls my readers oh so seriously), I am sharing my meal plan for this week. I looked in our pantry for things that I could use as sides (we always over buy those when we go to Big Lots and Targ and such) and made the meals around that. Here's to keeping myself accountable!